KuCoin will launch a special round of the Spotlight sale with MultiVAC (Rewards Plan for KuCoin Spotlight Token Sale) at 19:00:00 on 9/4/2019 (UTC+8), and then complete the distribution of MTV to all successful KuCoin Spotlight participants as soon as the sale is over. Users can confirm receipt of MTV tokens via the “Purchase History” in the KuCoin Spotlight page. Note: Users who successfully purchased MTV in the first round of the token sale on April 3 will not be able to participate in the special round of the MTV token sale on April 9. 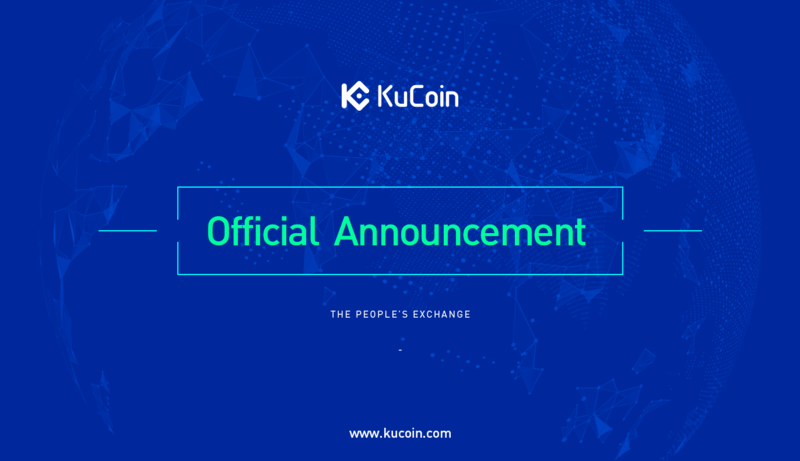 KuCoin will list MultiVAC (MTV) and open MTV/BTC, MTV/ETH and MTV/KCS trading pairs at 23:00:00 on 9/4/2019 (UTC+8). Deposits and withdrawal opening date will be announced separately. MultiVAC as a public blockchain achieves high-throughput, Dapp flexibility and infinite scalability. MultiVAC is developing the world’s first fast, efficient, and fully sharded blockchain with sharding for not only computation but also transmission and storage, maximizing throughput while maintaining decentralization and without sacrificing security. MultiVAC pioneers flexibility for DApps to trade off freely on the impossible CAP triangle between decentralization, performance and security, supporting large-scale decentralized commercial applications for complex and diverse business requirements. We provide a novel approach for blockchain to reach industrial capabilities. Risk Warning: Investing in cryptocurrency is akin to being a venture capital investor. The cryptocurrency market is available worldwide 24 x 7 for trading with no market close or open times. Please do your own risk assessment when deciding how to invest in cryptocurrency and blockchain technology. KuCoin attempts to screen all tokens before they come to market, however, even with the best due diligence there are still risks when investing. KuCoin is not liable for investment gains or losses. CopyRight © 2017 - 2019 KuCoin.com. All Rights Reserved.